1. There are many different lights outside the windows around here late at night. I always keep an eye on the sky. Was doing homework in living room. Happened to check on my car parked in driveway, saw green and red pulsating craft roaming the skies above houses. 2. its level of brightness. Its glow was brighter than a helicopter. Impressive. Moved back and forth with the capacity to stabilize itself without turning. Could travel in lines. 3. I didn’t think anything, was bewildered. I’ve never seen a drone that was capable of this before. Had to investigate. 4. I got in my car and drove toward it to get a closer look. Drove under it as it hovered over one persons house. No traffic, it was dark, I stopped in the middle of road. Pulled out phone quickly. Saw it was about the size of a trashcan which in my mind struck me as strange since it was without sound, and large. No propellers could have lifted it. It was dark, the green lights were very bright, plasma like. radiated like balls of light, no rays of light, or spot lights came from it. Perfectly hovered. Followed it around, watching it go into peoples yards, up and down. Later as the night grew darker, two others appeared from above it. 5. Excited, was an awesome sight to see, weather it was a drone or a ufo. I enjoyed seeing it. Curious if it or the controller knew I was following it. Seemed responsive to me. Couldn’t figure out why kids would be flying drones at night. There is nothing to see, no foot traffic, no detail. Figured it must be remote controlled, to small for a being to pilot. 6. I can’t remember how I lost sight of it. I must have just drove home giving up on understanding it. I have seen it about three times. I tried to put as much of the various video clips I took that night together into a single mov file. Cut the audio to censor my language. Was a little excited. The exact time I marked as aprox because I can’t remember if the timestamp was altered after I rendered the mov file that night. I’ve seen it at various times. I would say, it began around 10pm the first time, could have been 2 am. It was two years ago. 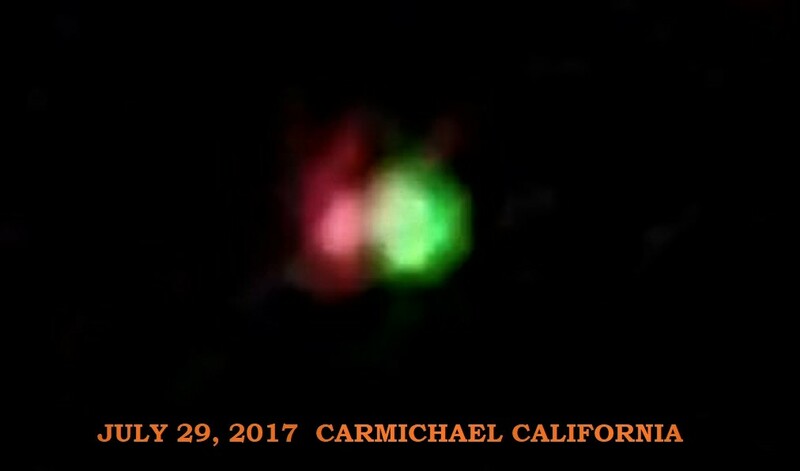 This entry was posted in ABDUCTION, best ufo photos, incredible ufo photos, MISSING TIME, top ufo news, UFO, UFO ARTICLES, ufo news, ufo photos, Uncategorized and tagged 2017 CARMICHAEL CALIFORNIA UFO PHOTO, 7-29-17 CARMICHAEL CALIFORNIA UFO PHOTO, ABDUCTION, ALIEN CRAFT, ALIEN CRAFT LANDING, ALIEN CRAFT PHOTO, ALIEN ENTITY, ALIEN IMAGE, ALIEN IMPLANTS, ALIEN PHOTO, ALIEN PICTURE, AMAZING UFO PHOTO, BEST UFO PHOTO, best ufo photos, BLOOD MOON UFO, CALIFORNIA UFO PHOTO, CIRCLE LIGHTS UFO, close encounter, CLOSE ENCOUNTER UFO PHOTO, DISC, FLYING SAUCER, HIGH STRANGENESS, HUMANOID, incredible ufo photos, JANUARY 20, JULY 29, KEN PFEIFER UFOLOGIST, light photo, MISSING TIME, saucer, SPACESHIP UFO, top ufo news, ufo, UFO ARTICLES, UFO LANDINGS, ufo news, ufo photos, ufo photos | Tagged ABDUCTION, Uncategorized | Tagged ABDUCTION, WORLD UFO PHOTOS, world ufo photos and news | Leave a reply | Leave a reply by KEN PFEIFER. Bookmark the permalink.